The endless effort, a pointless pursuit? Visitors to this site may be struck by the decades of history represented. The earliest FF, the four cylinder Wilkinson, is more than a century old. The Neracar used Hub centre steering eighty years ago. The 'Avro monocar', visibly similar to later FFs, was taking Mr. Roe to work in 1938. Surely there must be a reason for their continued obscurity? The commercial reasons for ignoring FFs are clear - Car and bike makers already have products that sell - and always have. Transforming them would be expensive and risky. The corporatisation of vehicle manufacturing makes it even less likely that global enterprises, detached from engineering realities, will engage with that expense or risk. Meanwhile the evolution of specialist media into product pushers, from the critical journals they once were, dependant on advertising from those corporates, has meant that even motorcyclists have remained almost entirely ignorant of FFs. Further, the transformation of the general public into expert operators of touch screens, instead of their 'hardware' oriented parents and grandparents, makes an attempt to explain the technical advantages unpromising. It's not even easy to explain basic features "Why would you have a heater on a two-wheeler?" Er.., to keep warm? Finally the technique of "Denial" has obstructed far more necessary transformations over the last half century. So this all raises the question; "Why bother with FF development and promotion?" Cars are cheap, most people are content with them and in any case motorcyclists generally are engaged in character validation, proving that they are 'real men', and occasionally women, by using a vehicle regarded by those car drivers as crazy. Taking out the pain and danger would spoil everything. FFs may allow their users to travel faster, using less fuel, in warmth, security and comfort but it's obviously a minority interest, satisfied by simple one-offs, so why the production prototypes, the constant pitching to disinterested corporates? It's simple. Powered Two wheelers are the quickest way of getting across town. Even carrying a passenger and some luggage. They are also the most fuel-efficient powered vehicles on earth. Various studies show that a take up of PTWs by the vehicle using public disproportionately reduces congestion and fuel use. Congestion is unpopular. Reducing fuel use is essential,. So, why don't people use PTWs in any meaningful numbers? You may have theories, I've done actual research. I'm an engineer, so academics and students are welcome to criticise this as "anecdotal" and "not statistically relevant" - while they do it properly - but this is what I did. I had access to a group of just over 200 people, all with motorcycle licences. Most had stopped riding motorcycles, some still rode them, a few had started riding FFs. They were asked either why they had stopped riding motorcycles, or what was the worst aspect of riding motorcycles. There was a spread of opinion but they all put one word at the top of their lists - "Pain"
The subsequent output, from the Banana, through to the Cmax and FJ, can readily be criticised for being crude, overweight and primitive. They've also demonstrated levels of comfort, handling and safety unachievable with a motorcycle or scooter. When the Cmax was delivered, it;s owner immediately drove it from Bristol to Naples. Later he came back for an MOT. He did this three times. FJ has a heater that provides warm air in the face at zero ambient. That's comfort. I won't bang on about the handling and safety - I'm told that's "Tales of derring-do". Contemplate the footage on this site of a Quasar being driven into a ditch, for a movie. Look at the 002 crash pictures. Make up your own mind. Performance like this is what has motivated the engineers concerned, in some cases for most of their working lives. This is why the search for a production partner has never ended. As I wrote this sentence I got news that the latest pitch to a manufacturer has been turned down. I long ago ran out of companies in England with the ability, let alone the will, to consider FFs. This pitch was to an American group. Eventually we'll get to the Chinese. The development of Electric Vehicles (EVs) should be the killer application for FFs. An EV is about efficiency, not power. A tiny electric motor can match the torque and power of a large Internal Combustion Engine (ICE), but will just flatten any reasonable battery pack faster than an even tinier motor better suited to the actual needs of the EV. A large part of developing an EV is controlling the massive torque of the motor. More performance in an EV, especially Range, requires improvements in efficiency, not power. This is where the unbeatable efficiency of the FF layout scores. It comes from the minimal frontal area, accentuated by modern aerodynamics. The Monoliner race prototype generates less than half the drag of a racing motorcycle. FJ, an ancient road-going FF, uses less fuel at speed than Skoda's most fuel efficient Turbo-diesel. I know this because my wife has one. If FJ turned it's engine off at traffic lights, it'd beat it in town too. A mass-market E-FF, without the problem of packaging an ICE engine into less available space than a motorcycle, minus exhausts, fuel and coolant systems, would be lighter than FJ and beat other E-powered vehicles on range, cost and performance. The majority of the vehicle-using public will struggle to afford E-cars for at least the mid-term future. E-motorcycles are exactly as uncomfortable and dangerous as motorcycle always were, while costing more to go slower. As Climate Change denial falters in the face of reality it's inevitable that a whole raft of ignored 'appropriate technology' will emerge into the mainstream. FFs are a part of that 'appropriate' future. That's why I think it's still worth promoting them. Submitted by Gareth.Jones on 20-Dec-16 11:36am. Not quite enough initials to win a 1990s Management competition, but a good opener I think. I was reading a thread on DIY electric vehicles and came to the same conclusion that an electric 2 wheeler would be a great idea except for the chronic drag problem, solved nicely by a FF vehicle. My day job is a Design Engineer so I'm quite used to ideas being laughed out of the room, but instead of looking for a manufacturer of other bikes to get the vehicle into production, is it possible to use an EV manufacturer who might be more sympathetic? Is there anyone on the Niche Vehicle Network that can help, or maybe the guys at Riversimple? I know they're using hydrogen but as a low volume manufacturer that seems quite good at funding, it might be worth a look. Submitted by paulblez on 11-Jan-17 11:40am. Electric FFs have frequently been discussed. Submitted by Royce on 16-Feb-18 5:40pm. It's good to see comments on this subject. It is a live issue after all. For an idea of what EV manufacturers think about two wheelers, look at the host of utterely traditional motorcycle designs on Electric Motorcycle News (there's a recent link on the front page of this site) An article introducing FFs as the logical E-powered two wheeler, plus Peraves benchmark "Two wheeled Tesla" feature. sank like a stone - and the electification of the motorised bicycle continues apace. The Niche Vehicle group did pay for the Monoliner wind tunnel session shown in the Video/film section of this site, but largely because they were guilty about a. not having heard about the Efficiency X prize (!) and B. turning down the Monoliner funding application because "after twenty years FFs aren't really innovative". Like they have a better idea. My personal, considered, opinion is that the Technolgy Support Group, and it's offshot, the Niche Vehicle Group, is just a typical British Establishment mechanism for giving money to the people they went to school with. I'm being polite here. Corporations get less innovative as they get bigger. 'Green fielding' a new vehicle project is insanely expensive (ask Triumph, Tesla, or Smart), only big corporations can afford it. And it's done to make money not better products and certainly not to save energy, or the planet, or any of that 'green crap'. So they'll make what sold last week. That more or less takes out the possibility of a major green field FF project from a corporate name you'd recognise. That leaves an existing vehicle manufacturer. Bike makers won't do it. it'll wipe out their existing market. Why did BMW stop making their popular, 'safe' C.1? Surely the story I heard, that their lawyers worried they'd be sued for continueing to make their 'dangerous' traditional motorcycle, can't be right?! Anything to say BMW? Carmakers won't do it, small cars, sold in volume are their bread and butter. No way will they entertain competition on type, they'd have to start thinking again. It's nice to think EV specialists might go for it, but Electronic Power Management gurus know about as much about vehicle dynamics as I do about Electronic Power Management... Much safer to put their new whizz bang EV powertrain into something the public will recognise. And that's a reasonasble point of view. Really there's only homebuilds, if you happen to be a vehicle engineer. And completely new entrants, either new corporations or very rich individuals. Probably not Indian coporations, they don't really do product innovation. Maybe the Chinese, once they get over making things cheaper than anyone else and start thinking about 'better' Maybe a random rich person. maybe not. I'm too old to wait for the Chinese and I haven't met many innovative rich people who haven't got their own ideas to chase. But I am a vehicle engineer, so I have got an FF. It's great. Really, it's down to all you young people, you're going to have to live through the end of ICE and two metre sea level rise. Good luck, stay mobile. Submitted by Royce on 30-Jan-19 4:54pm. Time changes everything. And without affecting the validity of any of the above submmisions there have been a couple of interesting developments since I posed the original question "why Bother". First is the arrival of BMW's C-Evo scooter and what might be called 'grown-up' power management. This is probably the most expensive part of any new E-vehicle development, but now it's done, although tweaking will be needed for any even similar vehicle, just like engine management systems have to be tweaked for variants of a single ice-powered vehicle. (every Mini variant had a different SU carburettor needle). This should mean that future BMW E-two-wheelers should be cheaper and easier to develop. The other change is visible to anyone riding Urban streets and we've got Amazon to thank. Other online delivery services are also vailable. It's the solution to the 'last mile' delivery problem. Initially solved by using diesel trucks and vans, the "Cargo Scooter" is increasingly visible. It's an informal solution, bicycle couriers and other enterprising (usually) young types are fitting large boxes to the backs of small scooters and flogging then to death round town. This is a 'greener' option than any sort of diesel, simply because of the much lower fuel consumption - and E-scooter options will be cheaper to buy than any of the E-vans that are also entering this market. Thing is, these cargo scooters are a bodge, follow one on wet city streets to see how unbalanced they are, check out the pathetic performance once they've accelerated away from the line. Consider the alarmingly short life to be expected from contiuous urban use. Think about what the specification should actually be for this promising and neccesary vehicle type. Really it should at least be the 'last ten miles', E-powered to allow use in the incoming ULEZ's. Then it could feasibly cover a whole city from suburban distribution centres, accessible to HGV's off the motorway network. A load capacity of 100Kgs should be achievable, providing significant multi-drop capacity. The production Voyagers can carry loads like this. Commercial vehicles, vans, are notable for excellent driver qualities - operators ask their drivers which are the best vans - similar comfort qualities would be atttractive in a cargo scooter. Look at the ridiculous loads one of the previous Cmax owners carried - http://bikeweb.com/node/2537. You can see where this is going. 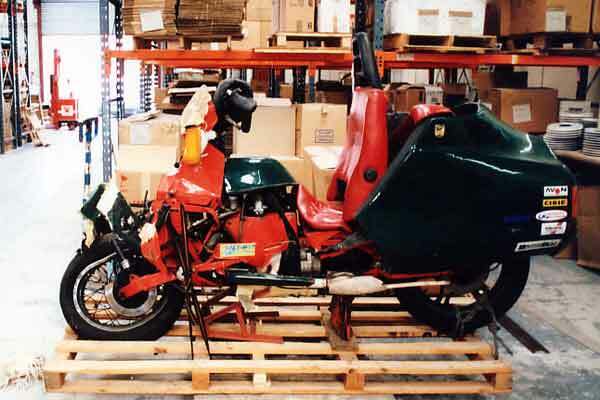 Even BMW must be able to see that a stripped down version of their CV-evo powertrain, optimised for freight and single rider comfort - with someone or others proper front suspension - would easily meet the specification for a real cargo scooter that would actually address the last ten mile delivery problem.